Feeling the pressure: FCR VP in April said, "I continue to be a freaked-out developer with an arena that must start this year"
Though the sale of a majority interest in the Nets to Russian mogul Mikhail Prokhorov has significantly buoyed those behind Forest City Ratner's Atlantic Yards project, the project still faces a tight timetable and a challenge in court. And, at least before the deal, at least one representative of the developer pronounced herself "freaked-out" by the need to get the arena started by the end of the year. Consider correspondence on April 28 between FCR Senior VP Jane Marshall and the Department of City Planning's Winston Von Engel. 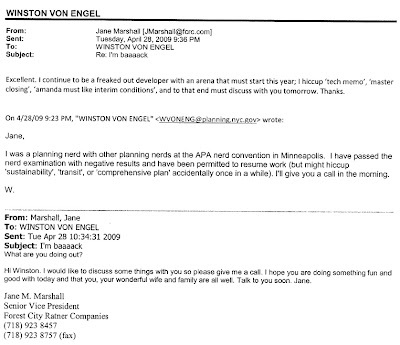 The email, obtained through a Freedom of Information Law request, shows Marshall asking Von Engel for a discussion and playfully expressing curiosity about his recent activities. Von Engel, in a similar tone, responded that he had been a "planning nerd" at the American Planning Association "nerd convention," which means he "might hiccup" such planning terms as "sustainability" and "transit." Excellent. I continue to be a freaked out developer with an arena that must start this year; I hiccup 'tech memo', 'master closing', 'amanda must like interim conditions', and to that end must discuss with you tomorrow. Thanks. To decode Marshall's shorthand, the arena must start this year if it is to rely on tax-exempt bonds and (likely) fulfill a naming rights agreement. Marshall may be a little less freaked out right now. But the clock is still ticking. The Technical Memorandum was released in June by the Empire State Development Corporation, almost surely with the collaboration of (and preparation by?) Forest City Ratner. It indicated that, despite apparent significant changes to the plan, no Supplemental Environmental Impact Statement (SEIS) was required. Two lawsuits challenging the absence of an SEIS are expected. The master closing involves the signing of certain documents for the project, including the sale of bonds and the start of condemnation. Many New York real estate executives accuse Ms. Burden of overstepping her authority by involving herself in design minutiae, dictating such details as the size of window sills and the height of park benches.